My monthly Verde Vegans Vegans potluck provides me with a constant opportunity to create new recipes. With all my summer traveling, the last one came up way too quickly. I had almost forgotten about it until the day before. Since I always make an appetizer, entrée, and dessert (because you never really know what everyone is bringing; and as the hostess, I want to make sure that there’s plenty of yummy food for all to enjoy), I had to think quickly. So, I made a mad dash into my pantry to see what inspiration would come my way. (Sidenote: this is when a well-stocked pantry can be a life-saver.) 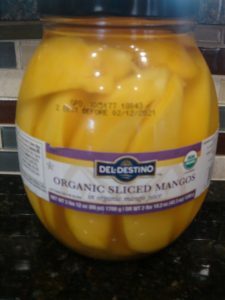 Ah, I immediately spotted this huge glass jar of organic mango slices in mango juice that I purchased from my recent jaunt to Costco (which, by the way, is really stepping up their game regarding organic and vegan items not only on their shelves but also at their food court—check out my recent Veganification Facebook post from August 6). Hum, alas, the start of a dessert. 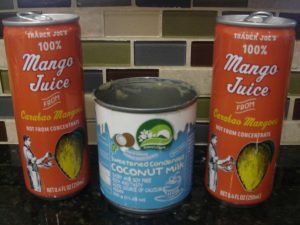 Looking further into the pantry, there’s a can of Trader Joe’s Mango Juice and a can of sweetened condensed milk alongside my cans of coconut milk. But, of course! Mango sticky rice! I always have a variety of rice on hand, so I opted for the organic brown jasmine rice. This recipe is good for a crowd. 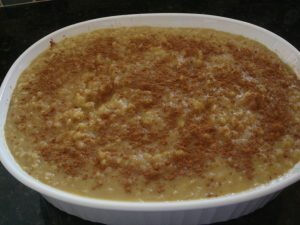 If you want to make a smaller batch, cut it in half…but I promise you, even if you are not having a crowd, you will be obsessed with this rice pudding and devour it in mass quantity in a flash. At the beginning, you’ll want to stir about every ten to fifteen minutes. Once the mixture begins to become viscous, reduce the heat to barely simmering and stir every five to ten minutes. You want to make sure that it doesn’t stick to the bottom and burn. Because I used a brown rice, it took slightly longer than if I used a refined white rice (I actually don’t even keep any refined white rice in the pantry). Figure on it taking about two hours from start to finish. I know this sounds like a long time, but believe me, it’s so worth it. Once it’s done, pour into a casserole dish, sprinkle with cinnamon, and allow it to cool completely before putting the lid on it and refrigerating for at least four to five hours before serving. 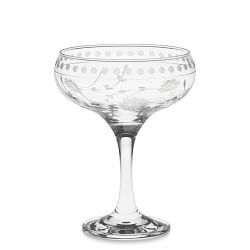 For some added panache, dollop into coupe champagne glasses and top with chopped fresh mangoes and or coconut whipped cream. « Tagine to the Rescue! !